Outstanding national award winner! 1957 Studebaker Transtar Deluxe Pickup Truck. 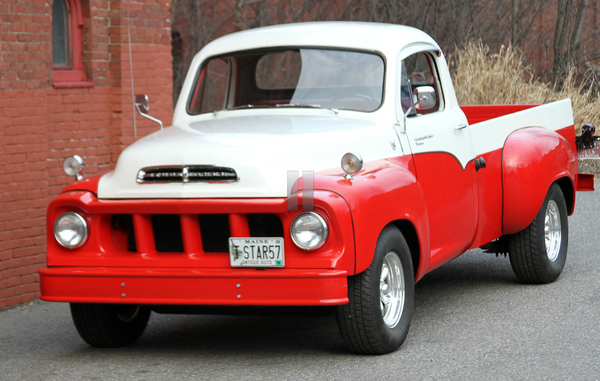 This fully restored V8 rare pickup truck is completely rust-free and drives like a champ. At the 2009 Studebaker Drivers Club (SDC) International Meet in South Bend, Indiana, this truck took 2nd place (documentation included). Odomete reads just 53,400 miles and the engine compartment and undercarriage suggest that this could indeed be the original miles (though true mileage is unknown). Model 3E-7, 1/2 ton with 8 foot bed. 259 C.I. V-8 engine, 3 speed with overdrive. Today the truck features special radial sport wheels and gleaming chrome rims, but we also have the original stock wheels and correct hubcaps in excellent condition--so you have the choice to return it to stock (which is what it was when it won the national award in '09) or leave sporty wheels on. 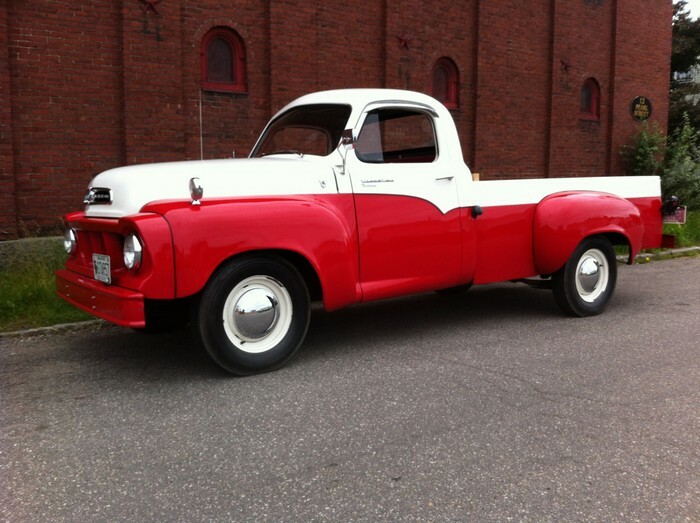 The truck is from the estate of an active and well-known local Studebaker Drivers Club member. The truck is so strong, it was driven from New England to South Bend, Indiana for the International Meet where it performed beautifully and took 2nd place. Over the past five years of ownership, the late collector carefully maintained the truck and there is a folder stuffed with receipts of maintenance work routinely done. In 2008, the owner spent $1000 on the Torque Thrust 15x7 sport wheels and chrome rims. As a bonus, you also get a heavy duty plastic truck tool box that can be mounted on the truck bed. Please note: The State of Maine does not require titles for antique vehicles. This car has a current Bureau of Motor Vehicle registration certificate with a transfer of ownership form and a Bill of Sale that will be provided to the buyer. If you have any questions, or to arrange an inspection visit, please contact Tim at 2077106699 or via email at tim@motoropolis.net Priced WELL BELOW the NADA high retail value of $41,900. This is a GREAT BUY for a truck you can drive and enjoy or show and win--or both! For sale or trade. 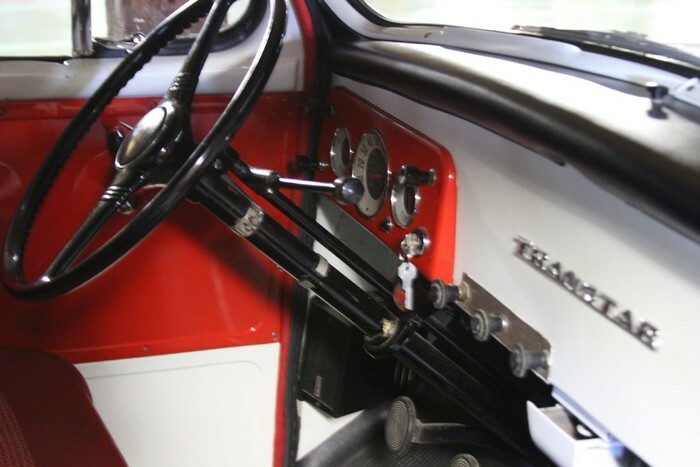 We welcome trade offers for other vintage cars and trucks. Easy financing available! We sold hundreds of classic vehicles since we opened. We can assist with all transportation arrangements. Motorland is a licensed classic car showroom and one-stop service center. Our service center offers repair, upholstery & interior restoration, body, paint, detailing, appraisal, vehicle locator, pick up or delivery, and storage. Our Showroom & Service Center is located at 2564 Portland Road, Arundel, Maine on US Route 1. We’re 90 minutes north of Boston and 20 minutes south of Portland, Maine. Our hours are Monday-Friday 8:30am-5pm and from April-November, we’re also open Saturdays 10am-5pm. Call us anytime at 207.710.6699. Email us at info@motorlandamerica.com. Paint Red and white repaint. Excellent but not concours show quality. Instruments Everything works. Modern radio AM/FM radio (not original).